The 4-star Novotel Mainz hotel is just a few minutes' walk from the city center and an excellent base from which to explore the city. Stay in one of our air-conditioned rooms or suites with flat-screen TV. With six meeting rooms and a meeting package, eve rything is taken care of for your business meetings, from providing the latest technology to ensuring guests don't go hungry. After a busy day of work or sightseeing, relax in the Novotel spa area or in our atmospheric bar in the vaulted cellar. The restaurant is located in a wonderful restored part of the Mainz city wall dating back to the 17th century. Whether with family, friends or colleagues, allow us to spoil you with culinary delights in a stunning setting. Our modern furnished restaurant is open daily from 6.30am until midnight and seats 120 people. Enjoy the delicious cuisine and fine wines on offer here. We also provide a children's menu for our young guests. After a tiring day, the Bajazzo's bar is the perfect place to unwind with your favorite cocktail, a cold beer or a glass of wine. Hot and cold snacks are also available. My stay was very nice and quiet. The fitness area is fine. However there is just one treatmill. The pool is fine. The whole experience was good, check-in was quick and efficient, the room was old but clean and set up to our requirements and was spacious and well kept. Everything was in good repair, but the bathroom had signs that it needs some maintenance. Check-out was less convenient and the fact that you have 1 lift operating all the time and especially on a Saturday is not very customer oriented. As usual, cheering people, great staff, nice room...the option to have the room cleaned or to redeem money to charities or as Club Accor Points is a nice new feature. Otherwise, the usual issue, a very limited choice of entrees at the restaurant, that I have already reported. I would expect more choices in a Novotel. 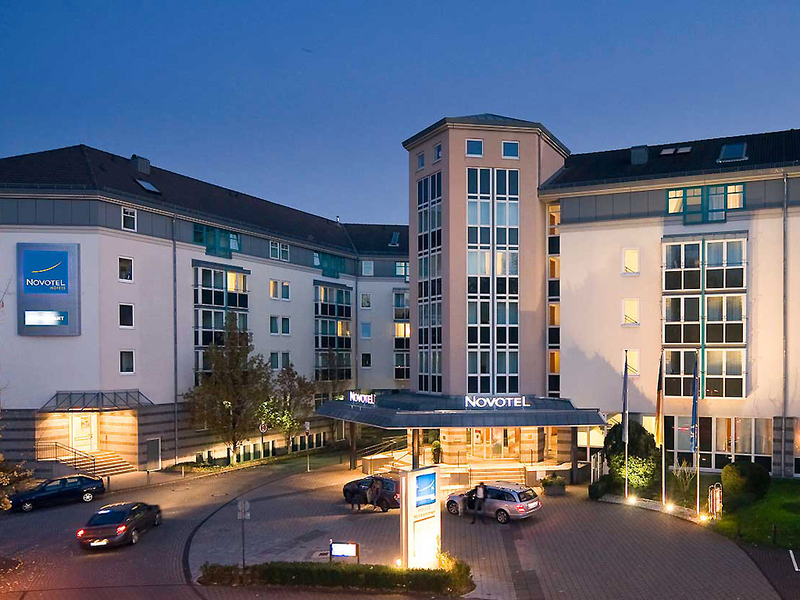 Every time that I travel to Mainz I look foward to stay at Novotel. Always make my business travel more comfortable. I stay here frequently as a crew member and this personal stay was excellent, as always. Thank you to the outstanding staff! The front desk personnel is very kind and professional. Rooms are clean and beds are super comfy. I used the pool, just love the ambience in the pool and spa area. An overall positive experience at Novotel! I still love to stay at Novotel Mainz but the rooms are getting a little bedraggled. Great stay except for the title sentence and there were two small problems with the room that I reported to the front desk and they said they would send someone to take care of them, they never showed up. I was in room 202 and the seal for the shower door glass was missing causing water to leak over the edge of the tub when showering. the second problem was the sink faucet was missing the out flow aerator causing the water to spray every where when the faucet was turned on. Theas problems are still not fixed to my knowledge. Quite good, but with improvement potential: 1. The shower head is small, primitive and doesn't hold. 2. The bath has scolded spots and looks old. 3. Not sure if the temperature regulator works - for me it was too warm to sleep and I didn't manage to change. 4. The menu in the restaurant is very limited for those who do not eat grains. Had to order a burger both evenings and leave the bread aside. No single other options grain- or glutenfree. Also the service was overstrained. The good things were: 1. Great breakfast - much better than the evening menu. 2. Beds were ok. 3. The room altogether looked nice and quite new. 4. Friendly reception staff. Clean, Euro-style hotel decor, pleasant staff. This hotel has very pleasant staff members. The hotel rooms are a good size and clean, but with typical Euro-style furnishings (i.e. not warm or particularly comfortable). Television channels have everything from German to Cuban, however English speaking channels, particularly movies and U.S. news programming are inadequate. Fine if you are on business, or if you use your computer for streaming shows. It is a great improvement in service level for check-in. Great help from Check in to link my Accor plus account with the current Accor account. The bedroom also now provide bathroom slippers.